Some years ago, The Professor was teaching in New York at Parsons School of Design. It was clear to The Professor, even in that late-1980s time period, that simply solving a problem—simply providing a “form follows function” solution—was no longer sufficient for his students or the world that their product-based work went out into. Put another way, industrial manufacture of the time had pretty much dialed-in standardized mass production, and that meant [almost intrinsically] that the action for the design profession was moving elsewhere [such as the action was back then]. To The Professor, the really juicy and interesting projects had to be about something other than solving a problem or creating a pretty form. Because he was based at Parsons—and the product design program there had emerged out of an existing craft-based program emphasizing proficiency in clay, metal, textile or wood—The Professor’s first thought was that design and craft had to come together in novel and hybrid combinations. Toward Industrial Craft. Toward mass-produced goods that integrated craft-based, one-of-a-kind details; toward craft objects that integrated industrial materials or mass-produced details. This approach met with some small successes. Industrial production, The Professor reasoned at that time, was overrated in the sense that it had become the de facto answer to every significant question of production. More to the point, standardized mass production was a phenomenon that, by the late-1980s, needed to be questioned, interpreted—and critically, willfully misinterpreted. It isn’t only technical capability that moves an idea along or causes a technology to progress; there must always be a concomitant cultural critique that calls the prevalent paradigm[s] into question and opens the door for re-interpretation and especially for misinterpretation. Fast-forward a couple of years. The advances in computing that started to be visible to The Professor around 1991* foreshadowed a not-so-distant future where the assembly line would be capable of creating thousands of individualized, even customized objects; even if they were batch-made, one-at-a-time individuation would be possible. The computer had helped make more things with both greater efficiency and lower cost; now it would be used as a tool to liberate the manufacture of goods. The microprocessor would [via code and algorithm] be instructed [when and how] to create meaningful difference; a few years further on, Joe Pine would turn his graduate thesis at MIT into Mass Customization [the book that truly launched the topic]. There were, of course, interesting precedents to learn from. One such example [for his particular “sequence in time,” as the historian George Kubler called such moments] was provided by architect Gaetano Pesce’s furniture, lighting and vases made of poured resin. But the thing was, when The Professor first saw Pesce’s work, his visceral reaction was that the objects looked as if they had been beaten silly with the ugly stick; they appeared at first to be handmade, crude, brash and lacking in care and subtlety. But as it turned out, important work is not always the most beautiful. For Pesce, those willful misinterpretations were the object’s best features. They rendered plastic playful [in a post-industrial way], complete with saving the human touches or marks that mass-production typically strives to eliminate; here they were left firmly expressed and fully evident on each object. The crafts field has long embraced these as tenets but here was Pesce trying to merge them with contemporary design practice. It is The Professor’s view that projects such as Pesce’s were among the first examples of Design Art [as it is now called]. As The Professor learned more of Pesce’s intentions—and as his own knowledge of the issues facing contemporary design increased—he came to respect Pesce and, ultimately, admire the work. Dating back to his furniture of the 1980s, Pesce essentially gave the color and appearance choices to the factory workers making the furniture. They were able to choose what color resin would be used; in this way, the makers decided the table’s color combinations. Not the designer. 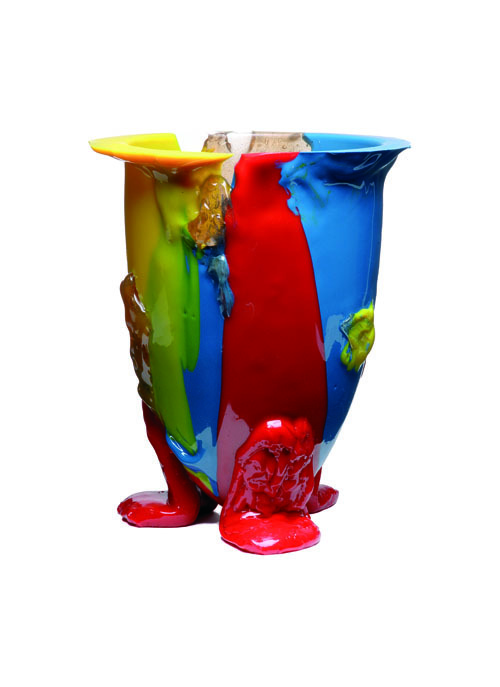 The result for Pesce was a methodology that he found applicable for all types of furniture, lighting and objects [including the Amazonia vase pictured above]. With each object being different, the consumer could choose the one they liked the best. Though the pieces are ugly by almost any traditional standard, these are decidedly and definitively what The Professor would call non-standard objects; it’s only when you get to know their story that they become appealing. This was a radical take on the manufacture of things. In retrospect, it was one of the developments that The Professor has pointed to as being key to the development of a democratic design approach, ultimately including that of open-source hardware and software. It’s also an approach that seeks to share the power of design [or the credit] with its constituents, with the skilled workers involved in the factory-floor decision-making process, and with consumers voting with their wallet [and/or their attention span] for the one that they like best. For Pesce, the future of design was in singularly unique instantiations of a product idea; he got his workers to willfully misinterpret the products that they worked on. For The Professor, thinking of a consumer product as a member of a family gave each product a reasonable and comprehensible logic; designs should look like each other but also simultaneously look different and distinct from each other. Instead of being an “either-or” solution, these “variations on a theme” would occupy the more ambiguous space of “both-and,”as in both similar and different, but that’s a Robert Venturi story for another time—and that’s why they call me The Professor. * In 1991 The Professor spent much of his time at Stanford University’s semi-legendary product design loft where he and Chris Cavello discussed this emerging frontier of purposefully coded programs as well as more mechanical hacked interventions.